Diamond and platinum pendant necklace set with synthetic sapphire, circa 1930. If it looks like a duck, walks like a duck, and quacks like a duck, it probably is a duck, right? Maybe ‚Ä¶ or maybe not when it comes to gemstones. Synthetic gemstones have the same chemical makeup as their naturally occurring counterparts. The difference is synthetics don‚Äôt originate randomly below ground through the geologic influences of nature. Instead, they are created under controlled conditions in a laboratory. Synthetic stones aren‚Äôt fake, faux, or costume, and shouldn‚Äôt be confused with brand-name inventions like moissanite, diamonelle, etc. They aren‚Äôt pastes, rhinestones, or marcasite, either. Despite the similarity in the name, cubic zirconia (CZ) ‚Äì which has no equivalent counterpart in nature‚Äìhas nothing to do with zircon. CZs are a look-alike for diamonds, but don‚Äôt have the same chemical makeup. A dictionary definition of the term synthetic states that it refers to ‚Äúcompounds formed through a chemical process by human agency, as opposed to those of natural origin.‚Äù Synthetic gemstones have some major advantages over the real thing. Flaws and impurities present in nature can be diminished in scale and saturation of colour can be evenly distributed and matched. The majority of us are comfortable using synthetic oil in our car engines, walking on easy-care synthetic carpeting, wearing wash-and-wear synthetic fabrics, or sitting on synthetic leather-look chairs while we swallow our synthetic vitamins. In these instances, there is no stigma attached. But use the term synthetic when selling jewellery, and the implications is it is a substandard material. This wasn‚Äôt always the case. During the 1920s, jewellery designers at well-established houses with reputations for fine craftsmanship had no qualms using synthetic stones in their designs. These days, however, the occasional client will choose to replace synthetic stones with something natural. While the antique vintage value may be compromised, a happy client is a return client. 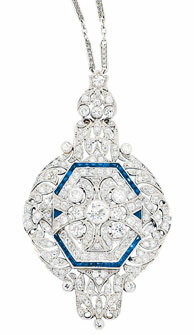 Diamond and platinum plaque pendant set with calibre-cut synthetic sapphires, circa 1920. 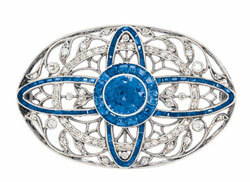 Platinum, diamond, and sapphire brooch circa 1910. The center stone is a real sapphire, while the calibre-cut accents are synthetic pphires. Progressive shifts in technology between the two world wars occurred due to sweeping alterations during and following the post-industrial ‚Äòmachine age.‚Äô Methods and inventions like the assembly line, and tool and die machines constructed with their precisely calculated calibration, were changing the scope of manufacturing; everything new‚Äìfrom the airplane to the zipper‚Äìwas hailed as revolutionary in terms of increased industrial production and profit. Anything man-made was glorified. It‚Äôs into these circumstances that synthetic gemstones were born as an acceptable choice for decorating high-quality rings, brooches, bracelets, etc. If natural stones were a good choice, then man-made were ever better and more enticing. Synthetic stones were marketed to the jewellery-buying public as a specific selling feature that could often cost more than their natural counterparts, since they were considered more rare and uncommon due to having being engineered in a laboratory. Newfangled innovations were embraced as part of the grand, modern future. You‚Äôre most likely to see items from the Art Deco period featuring main stones in old European, Asscher, emerald, pear, shield, or triangle cuts, enhanced by coloured thin lines of caliber or baguette cuts forming geometric linear angles. Channel settings of synthetic rubies, sapphires, or emeralds contrast with diamonds in wide filigree strap bracelets, plaque pendants, and wristwatches. Less common is a ‚ÄúToi et Moi‚Äù style ring, set with a pear-shaped diamond and a synthetic blue spinel. Sometimes, the setting is the dominant factor in a design. Consider a ring containing two CZs and a synthetic blue sapphire set within a hefty chunk of platinum. In this case, the metal‚Äôs substantial weight‚Äìall 84 g of it‚Äìwas more important to the designer than the gems. Watchmakers utilized colourless synthetic corundum for watch crystals for its superior scratch‚Äìresistant qualities and clarity. 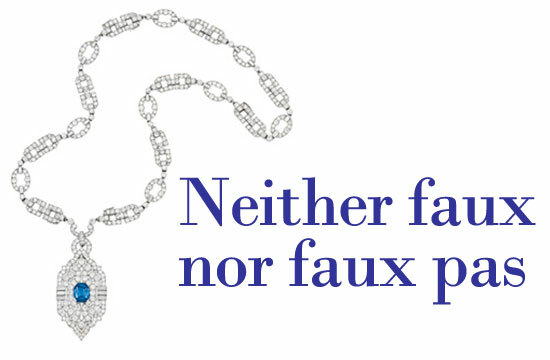 So synthetic doesn‚Äôt mean second-class or less worthy when it comes to estate jewellery values. In fact, it is perfectly acceptable and not considered by professionals to be inferior in any way. Actually, their presence in a piece can hint at the authenticity to the period, thereby adding to the credibility regarding the circa dating. Conventionally accepted meanings can be misunderstood when used out of context. Don‚Äôt be held back by terminology. Instead, embrace these innovations from the past in your future sales. Developing this appreciation gives Mother Nature a break and after all, she‚Äôs under enough pressure as it is these days.